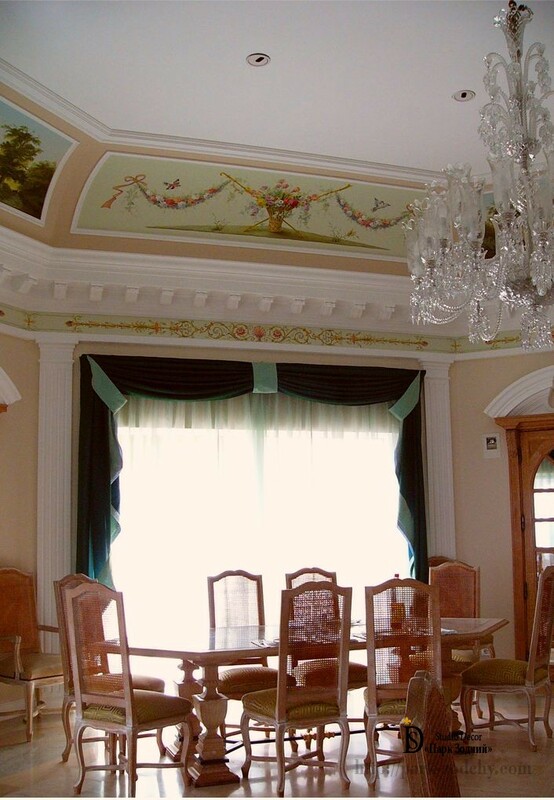 The sea coast, where the villa is placed, has become the starting point in choosing the interior decoration. 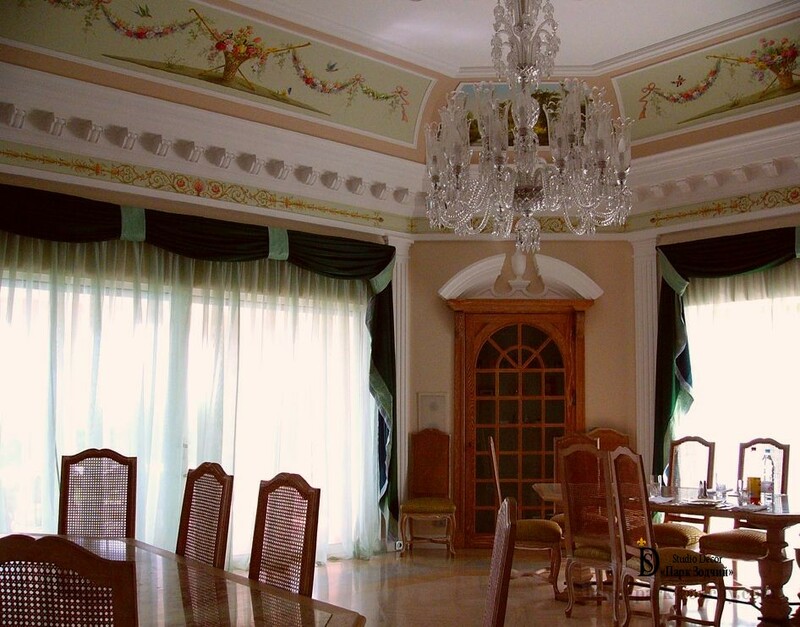 Classic dining room has combined interesting decorating techniques: light Mediterranean tones, delicately done painting, tables with marble countertops and unusual stucco moldings of portals. Often, the environment leaves a mark on the life of the person. Accordingly, certain preferences in organizing and decorating the interior space of the home appear. It was necessary to decorate the premises pampered in the sun so that they were not extracted from natural environment outside the window. You must admit that wooden blocking looks remarkably in the Midland of Russia among century-old trees, but it would be totally inappropriate close to the sea and the light villas with large windows and open porches. 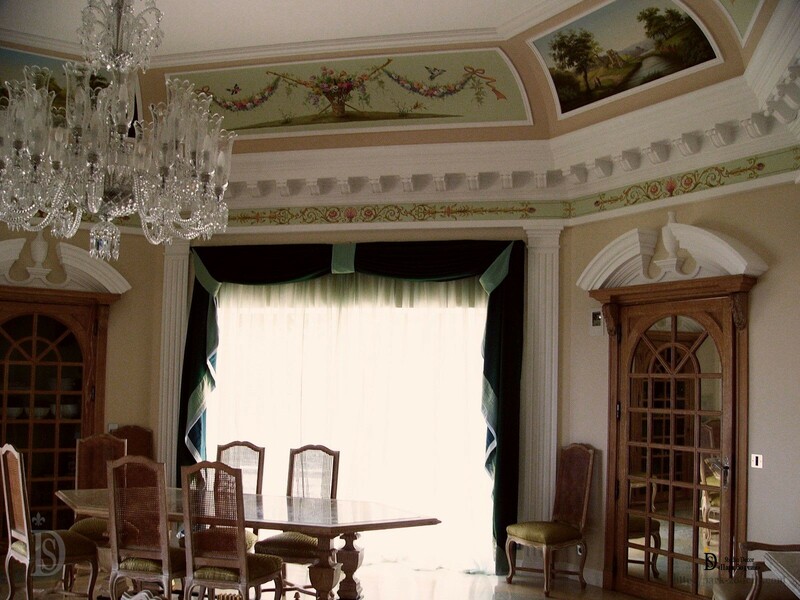 Therefore, it has been decided to decorate large, bright premises with large window apertures, using Mediterranean motifs. Light, sandy walls are complemented by crisp white pilasters, stucco moldings of the door portal and wide ceiling frieze. Sophisticated decor has been chosen for the border: painting of the ceiling. But it does not weigh down the Interior and separates the ceiling from the stucco frieze with laconic volutes. For decorating the windows, it has been decided not to choose complex variants with the gorgeous folds of lambrequins. Dark drapes are decorated with light-toned valences and picked up with similar tiebacks; they have created a soft portal for communication with the outside world, and airy curtains soften the burning rays of the sun. Marble countertops are quite appropriate in this interior. Sultry climate outside the window is remarkably well-balanced by coldness of natural stone. Interesting form of the premises have required serious attention to decoration. There are no right angles here, so the room is large open plastic space, which requires classical interpretation of decoration. Therefore, a sure variant has been chosen: mirrorlike decoration and furniture arrangement. Windows are framed with pilasters that visually have raised the ceiling, have joined the premises with a single line of the decor. Recurring elements make the dining room integral and harmonious. At first glance, it might seem that the premises have two similar doors. But actually one of them is the door of built-in china closet. Large-sized stucco has made these two objects elegant, has balanced the dark color of wood. Art painting of the walls in an interesting way has used to the best effect the border and revived the Interior. Stretch ceilings would be inappropriate in the Interior, that is why white ceiling looks consistent and is a perfect backdrop for rich chandelier. It is hard not to agree that the Interior is integral, creating an atmosphere of relaxation. In contrast to modern ferroconcrete structures of villas with glass walls, the dining room is more elegant and at the same time pleasant and cozy.